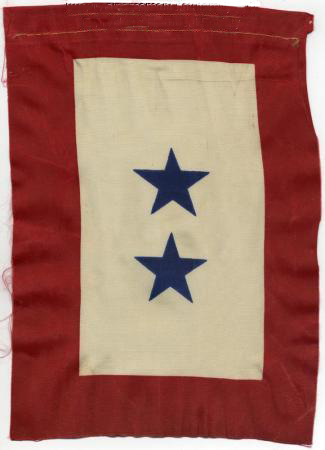 Port Morris families with men in the service during the war would hang these flags in their windows. Each star stood for one person serving. 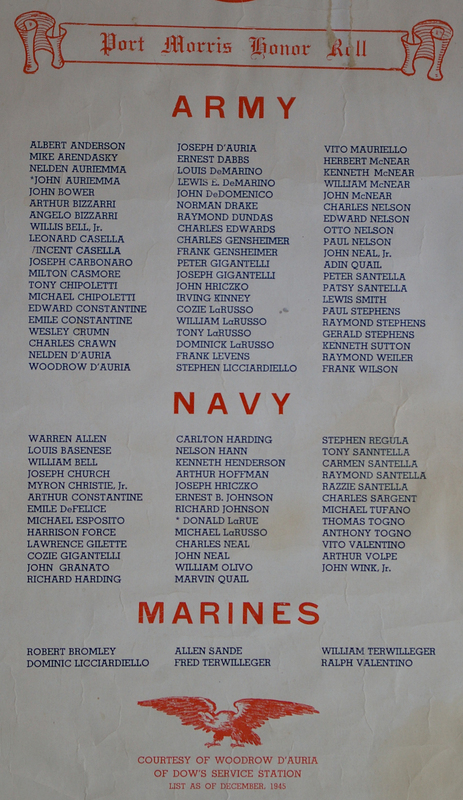 This Port Morris Honor Roll poster was printed just after the war ended as a tribute to the local residents who served. 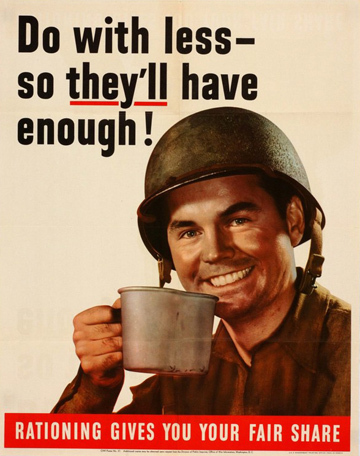 Thus, the Army had 63 men in uniform, the Navy saw 39 serve, and the Marines had 6, a total of 108. An amazing sacrifice for a small town of about 950 residents. We owe them our gratitude. threatened by a fascist dictator. Two of them made the ultimate sacrifice. The idea for this page began when Bob Waldron, a long-time Port Morris resident, contacted your Editor to offer vintage Port Morris images for posting on this website to add to those I had already gathered. His engaging photos are displayed on two of the Port Morris pages. On my second trip to his home he produced the original 1945 poster displayed above, the rooster of those who served during the war. His father-in-law, Razzie Santella, is one of the names there. As he began to talk with old-timers around town, especially those who gather at Sam Vaia's garage, the stories of those who served started to come out. Bob is feeding me that info, we are searching the web together, and I'm displaying the results here. There is no doubt that this initial posting will open the floodgates of memory for families with Port Morris roots, and we expect that the page will grow and grow as people send in their photo scans and stories. We welcome them and will display them. 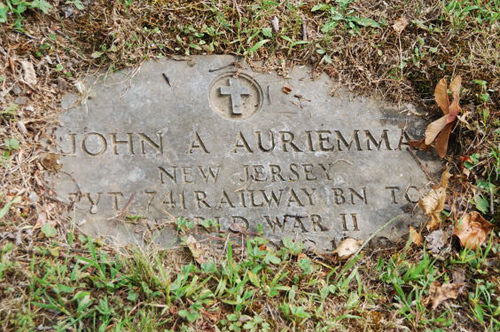 Two Port Morris men gave their lives during the Second World War: John Auriemma and Donald LaRue, those shown above with the 'star' next to their names. We have info about them below and are seeking additional details. 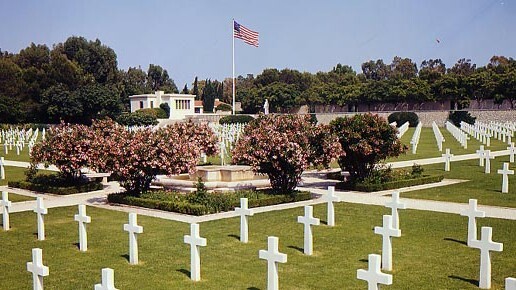 Each Memorial Day we are reminded of the sacrifices the previous generation made so that you and I have our freedom. Port Morris New Jersey is part of Roxbury Township, an area that answered the call to defend our nation. 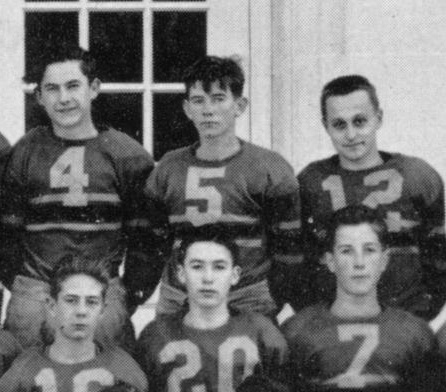 The 1939-40 Roxbury High School Football Team. The boys who went to war. 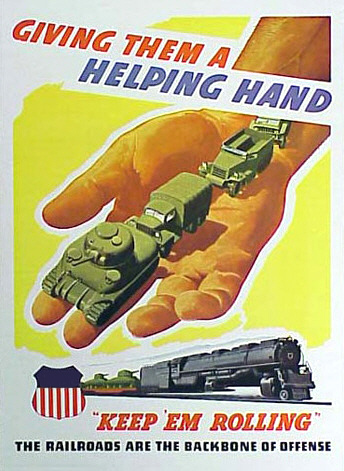 Private, 741st Railway Operating Battalion. his father Hampton C. LaRue is buried in Hackettstown, NJ. Donald was the first casualty from Port Morris, passing on November 8, 1942. Within months a memorial evergreen tree was planted as a remembrance for him, donated by the Blackwell store and planted in a ceremony by the Boy Scouts. It was planted in 1943 alongside the "Port Morris Honor Roll", an outdoor plaque on Center Street that displayed the names of Port Morris men serving in uniform. That plaque is seen in Sal Valentino's Port Morris history page on this site, the link is below. 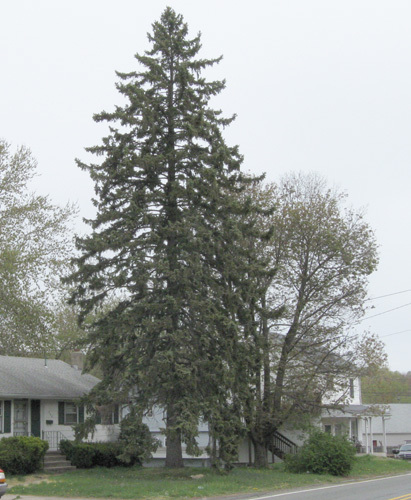 The tree stands in front of 266 Center Street, the photo at lower left was taken by the Editor in April 2012. The Chipoletti family ran a small store on Center Street, it was one of several gathering places for people in town. There was a pool table in the rear and men would sit around and play cards. Michael was one of their sons, and WW 2 found him serving in his Uncle Sam's Army. Of all his battle experiences, the most dramatic was when a bullet came whizzing by and took off a part of his skull. He was safely treated and evacuated, and is still living in the area. The LaRusso family home is on Main St. They operated a Fireworks business on their large property from before WW2 up through the 1970's. Sgt. Anthony LaRusso served in the US Air Force as a Tail Gunner on a B-17. On April 8, 1944 his plane took off from an English airfield for a Bombing run over Nazi occupied Europe. They bombed their target but were hit by flak as they started to return, damaging the plane. Over Denmark an engine caught fire, spreading to the cabin. The pilot safely belly landed in a field where the men scattered in groups of 2, attempting to make contact with the Danish Underground, several did, but LaRusso and his buddy were captured by German soldiers a day later. They were sent to Dulag Luft, a POW Camp in Germany. Dulag Luft was liberated by the American Army on March 29, 1945. There are several branches of this extended family in the Port Morris/Netcong area. Some spell the name LoRusso, which Michael used in latter years. He served in the United States Navy as an Aviation Machinist Mate from 1944 to 1946. He worked for the New Jersey Transportation Dept as a mechanic. The June 1944 D-Day Allied Invasion of Nazi occupied Europe was the largest military operation in history, with tens of thousands fighting their way onto the beaches at Normandy, and thousands more who were dropped by parachute behind enemy lines. John Neil, a Port Morris boy, was one of those paratroopers who was dropped in. During one battle he was shot in the back, was safely treated and evacuated. Razzie Santella is one of 6 Santella brothers who served in uniform in WW II. Razzie served in the Navy on the USS William A. McKenney. He was onboard as the ship was off the coast of British Guiana on October 4, 1942 when she was torpedoed by the German submarine U-175. In the continuing attack the fuel was set ablaze and the crew abandoned ship, having been able to launch lifeboats. As the McKenney started to sink, the U-boat slipped away. The Americans suffered one killed, and their lifeboats were spotted the next day by the USS Blakeley which made the rescue. The German sub was sunk in April 1943 by the USCG Spencer. 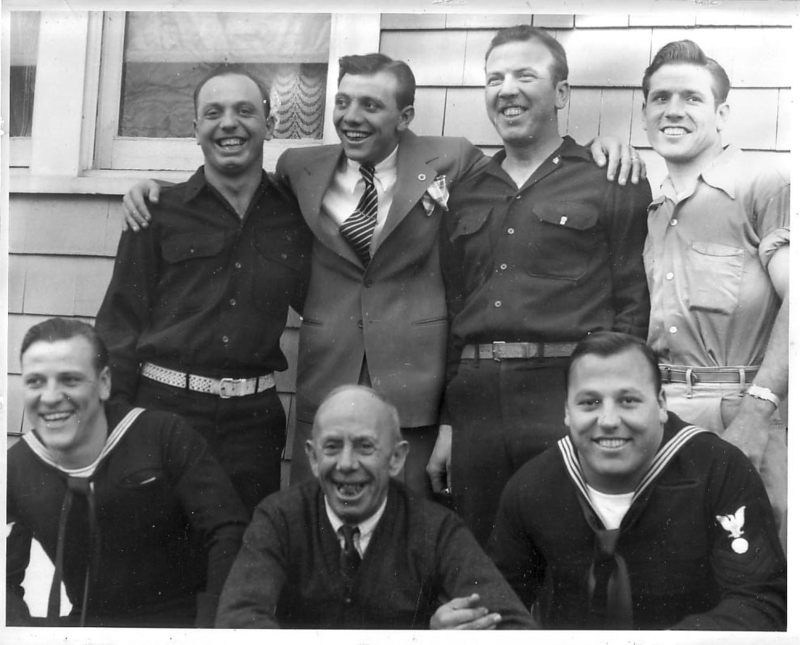 The "Six Fighting Santella Brothers" are profiled below, with Tony serving in the Navy on a ship that was in many Pacific battles and invasions. When the war was over and everyone gathered to swap stories, it turned out that Tony had the most battle stars of anyone from Port Morris. He attended Roxbury schools and the Casey Jones School of Aeronautics. After working at the Rome Airfield in Rome, NY, he enlisted in the US Navy and served during World War II in the Asian Pacific Theater on the cruiser USS Los Angeles. Johnny Wink served in the US Navy during WW II. He was in the bloody battle of Guadalcanal, something he would not talk about. We invite you to send us your relatives story, we'll post it !! The six Santella Brothers of Port Morris were shown in an article from 2008, at left, profiling their service to their country during World War II. Photo circa 1946. All six came home and many of their children, grandchildren and great-grandchildren still live in the area. Strange But True: During the war, with his 6 sons in American uniforms serving, the dad Antonio heard a knock at his door. There stood two Federal agents, and Antonio feared the worst. They asked him if he was born in Italy and if he had any guns in the house. Yes, he was born in Italy and had an old hunting rifle. The agents confiscated his rifle, saying that because the USA was at war with Italy, he was a danger! No amount of pleading or proclaiming that he sent his 6 sons into the US Armed Forces would dissuade them. After the war, when his sons all came back, they heard the story. Immediately, the WW2 Vets drove down to the Federal Office, some of them in uniform, and demanded their old Dad's squirrel hunting rifle back. Federal Intelligence at work !! MORE WILL BE POSTED SHORTLY . . .
©2010, 20014 LandingNewJersey.com and M. Balston. Much of the info on this website was personally researched by the Editor and is unique. Please do not reproduce or use on another website without permission. Carol Santella Waldron and Robert Waldron, long time Port Morris residents and local history researchers. This page is a voluntary service of LandingNewJersey.com, a privately owned website.